Left to Right: Alison Kennedy, Director of the STFC Hartree Centre, STFC Hartree and Andy Grant, Vice President, HPC & Big Data, Atos in UK and Ireland.5 Feb 2019 Paris, London - Atos, a global expert in digital transformation, has signed an agreement with the Science and Technology Facilities Council's (STFC) Hartree Centre that will see one of the UK's leading high-performance computing research facility take the first UK delivery of an Atos Quantum Learning Machine, the highest performing quantum simulator in the world. This new collaboration builds on an established partnership between Atos and the Hartree Centre, which began with the UK's first Bull Sequana X1000 supercomputer being hosted at the facility in 2017. The Hartree Centre, based at Daresbury Laboratory and part of the Sci-Tech Daresbury Campus in Cheshire, UK, also hosts the JADE national deep learning service. 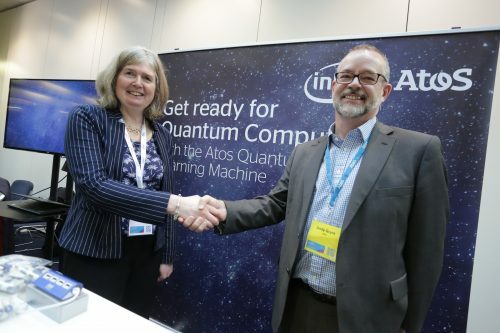 Commenting on the partnership announcement, Andy Grant, Vice President, HPC & Big Data, Atos UK and Ireland, stated: "We are delighted to deepen our existing relationship with the Hartree Centre, which we believe will help UK industry future-proof itself for the arrival of quantum computing. Our Quantum Learning Machine as a service will be made available to any organisation wanting to learn about, and experiment, with quantum computing and understand the key opportunities and challenges this technology presents. Quantum is the future of computing and it is crucial that organisations are ready to harness the coming revolution." Alison Kennedy, Director of the STFC Hartree Centre, stated: "We're thrilled to be enabling UK companies to explore and prepare for the future of quantum computing. This collaboration will build on our growing expertise in this exciting area of computing and result in more resilient technology solutions being developed for industry." Leigh Lapworth, Head of Computational Sciences at Rolls-Royce, which will be one of the first organisations to use the quantum simulator, stated: "The Quantum Learning Machine will provide a platform on which we can develop new quantum algorithms with potential impacts across our business. We have a long track-record of successful collaborations with the Hartree Centre and with the support of Atos we look forward to research that takes us in new and exciting directions." In November 2016, Atos launched an ambitious programme to anticipate the future of quantum computing and to be prepared for the opportunities as well as the risks that come with it. As a result of this initiative, Atos was the first to successfully model quantum noise. To date, the company has installed Quantum Learning Machines in numerous countries including Austria, Denmark, France, Germany, the Netherlands, and the United States empowering major research programs in various sectors.